HEATHERS. IT’S THE DREAM, RIGHT?? I discovered Heathers on Pandora about two years ago- I was playing my Broadway playlist on my way to work, as one does, and “Beautiful” came on. Well, it’s a long song, so I sat in the parking garage at work listening to the end (and was almost late clocking in, oops. But so worth it.) I just don’t understand why more theaters don’t do it- I’ve been waiting for someone to put it on in my area ever since. Luckily, not only was CTCO doing it (fifteen minutes away from where I live!) 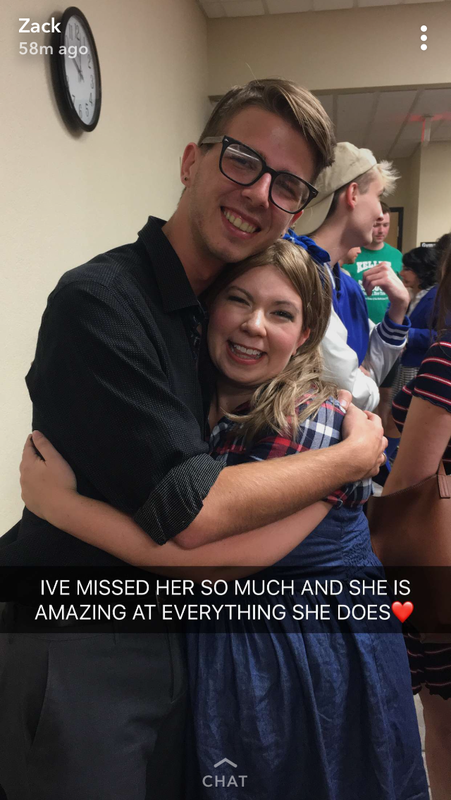 but my friend Taylor, who played Horton in Seussical with me, was directing it. So I was over the moon to audition. 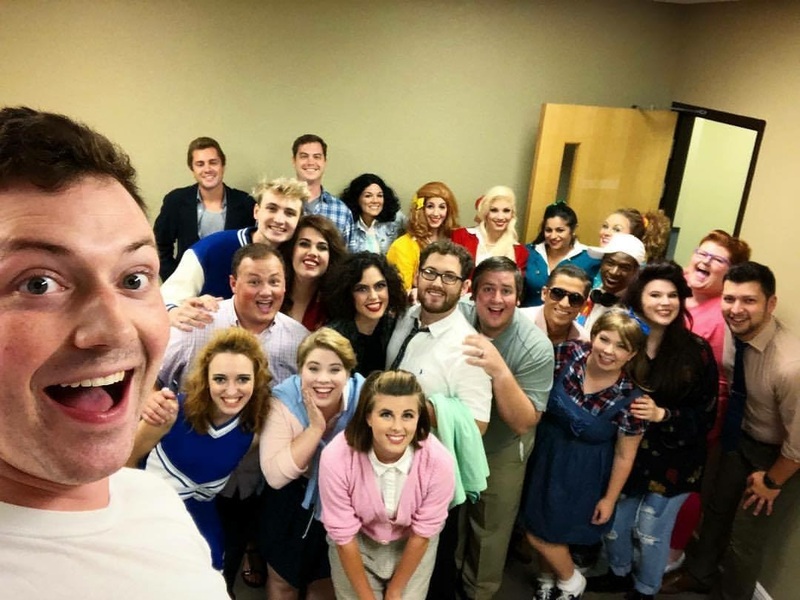 I sang “What It Means to Be a Friend” from Thirteen and called back for the ensemble. Was I disappointed to not be called back for a lead? Absolutely. But a lot of incredibly talented people auditioned. And I also went into this knowing that I was probably going to end up in Evil Dead, and the rehearsal schedules would overlap. There was no way I could feasibly play leads in both shows. The callback for Heathers was a lot of fun, and to my surprise Taylor held me to read for the role of Veronica’s mom. I ended up getting the part! Usually Mrs. Sawyer is doubled with Ms. Fleming, the teacher, but we went with this instead and it was a blast! Rehearsals got a little bit tricky, though. Heathers overlapped with Evil Dead, which performed out of a theater ten minutes down the road, so usually I would attend the first hour or two of Heathers rehearsal and then go down the road for Evil Dead. Poor Shane barely saw me- I was rehearsing six nights a week, on top of my new job! (Because of course Movie Ride closed during the rehearsal process and I had to start training for Safaris immediately. Yikes.) And for a short time, the It’s a Date cabaret overlapped too. Ugh. No wonder I was so stressed for so long. The only way any of this worked, though, was communication. All my directors and stage managers knew exactly what was going on, and they were really flexible. So if I had to miss Heathers rehearsal completely for the Evil Dead photocall, I could, and if I needed to miss Evil Dead for a Heathers full run, I could. I’m so glad I didn’t have to pick, because I’m honestly not sure which one I would have chosen. The music for Heathers is super complicated. Like yeah, I knew the lyrics for the most part because I’ve played through the cast recording approximately a million times. But the parts. OH LORD. “Yo Girl” is literally the most complicated thing ever; I was honestly not too upset when I found out I didn’t need to sing that song after all since Mrs. Sawyer had to be onstage for bits of it. So if you end up in a production, don’t think you can slide by since you have the OCR memorized. It’s so specific. 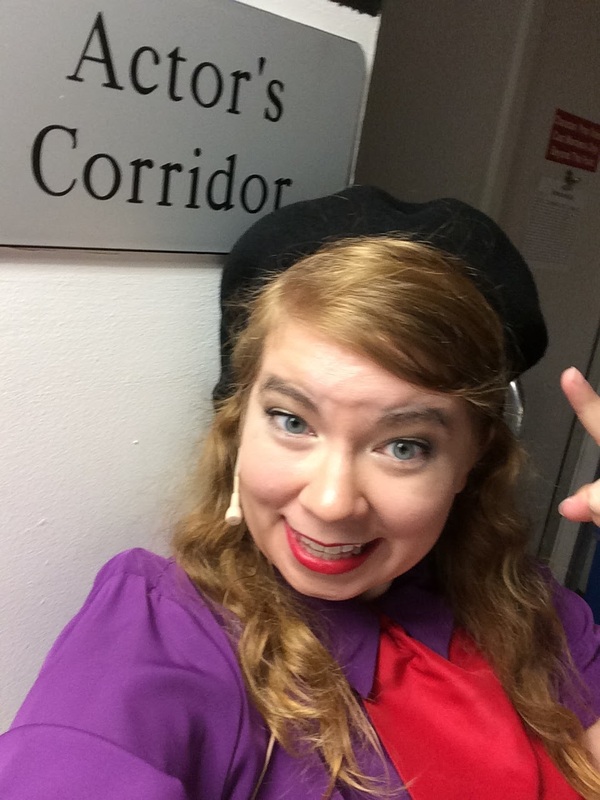 I ended up taking two tracks in Heathers, one as Mrs. Sawyer and one as a student at Westerberg High. The director was really great about us developing a real feel for our characters and finding unique characterizations. 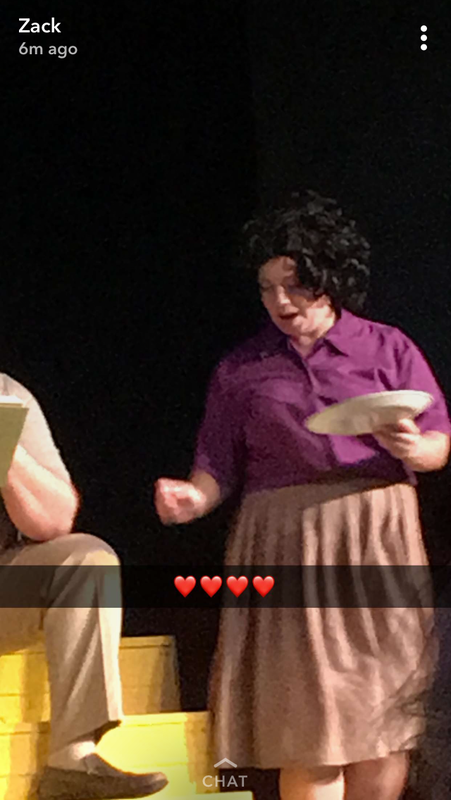 So of course we had the Nerd and the Republicanette and the other written ensemble characters, but we each had really specific characters for each ensemble member, which really made a difference in the strength of the show. 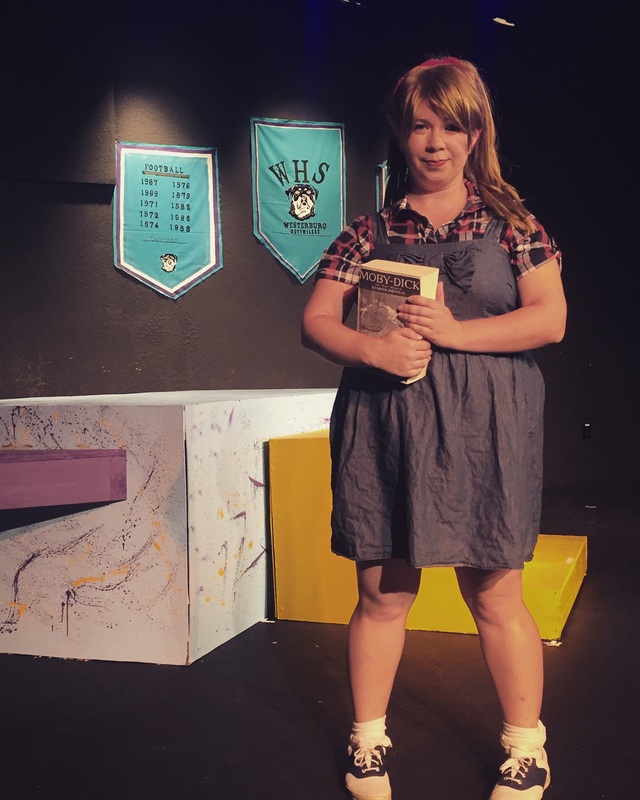 I described my characters as “Carrie White, with no powers.” Basically me when I was in elementary/middle school, now aged up a bit- very sheltered, very anxious. 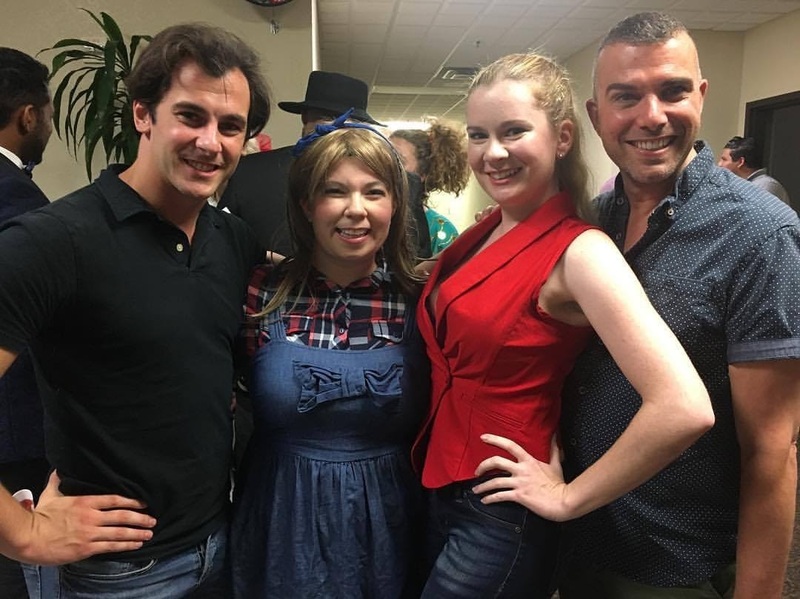 I got to develop my own costume with the approval of the director, so I went with a plaid button up shirt, a denim jumper, lacy ankle socks, and saddle shoes. Originally I had a red bandana in my hair as a headband, but Taylor pointed out (and rightly so) that Heather Chandler should be the only one with red. So I borrowed a blue bandanna from another cast member instead. 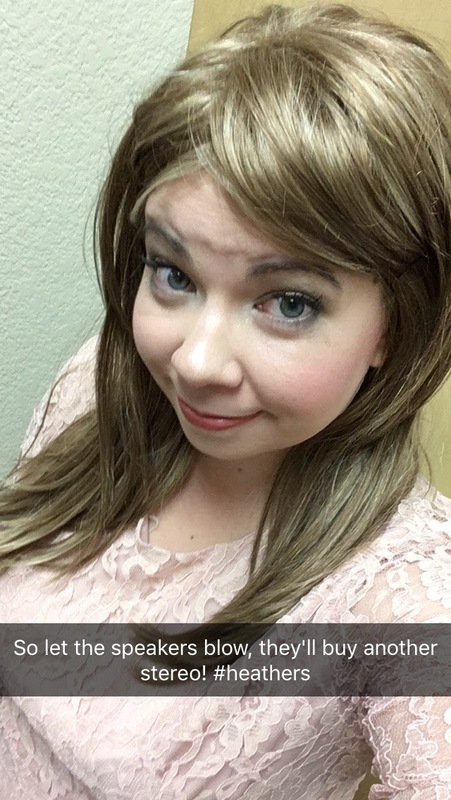 Speaking of my hair, though, I had the most killer wig. I think the best way to describe it is “someone from the 80s time traveled to the 90s, saw Rachel’s haircut on Friends, and then went back to the 80s and tried to describe it to their stylist.” It was a mullet and yet not a mullet. It was stellar and I adored it. And then there was Mrs. Sawyer. 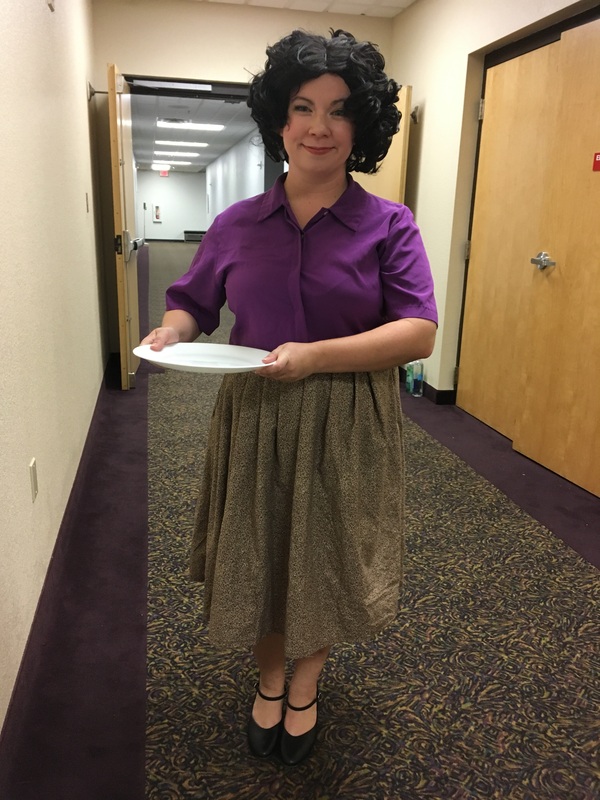 My wig is a glorious Betty Boop/Betty Rubble pile of curls- they wanted me to look more like Veronica, and the blonde mullet wasn’t going to cut it. The shoes are just my basic black character shoes, and the skirt was made from fabric and a zipper I scrounged up in my stash. The shirt, you ask? You might recognize the shirt. It’s definitely not my gangster shirt. I don’t know what you’re talking about. 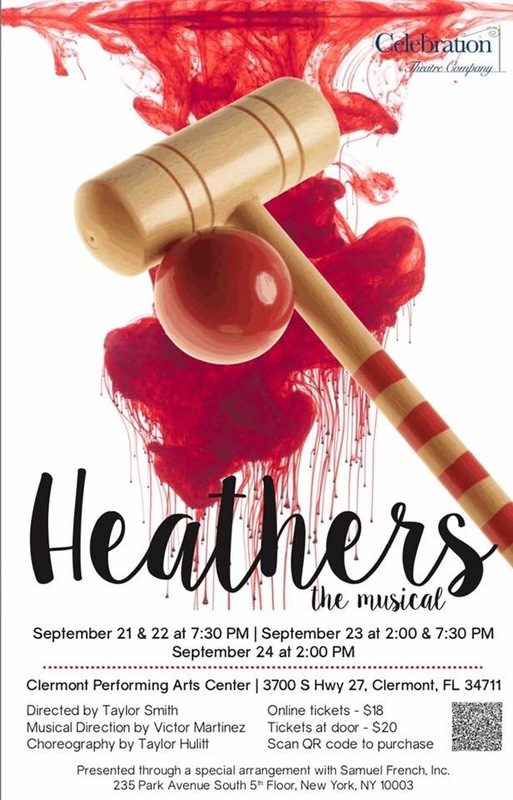 Heathers only ran for one weekend, but it’s a show I could do over and over again and never get tired of it, no matter what role I’m playing. But I don’t think it would be able to top the cast of this production. Everyone was so talented and brought their A game 100%. It was such a great time. And of course people came to visit it me, including a couple of Deadites!! I’m going to do a tutorial for Vlogmas next month about how I did my 80s inspired Heathers look; it’s going to be super chatty and I’m going to talk about the show, so ask me all the questions you have down below!! I want to answer all your questions, about the show and my experience and theatre in general!! In the meantime, I’m going to go serve some liverwurst and pretend it’s pate.